This crimson soup looks and tastes amazing. 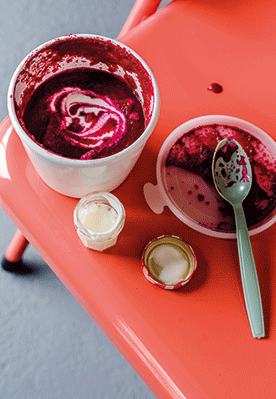 Even if you think you are not a fan of beetroot/beet, give it a go; it’s delicious combined with lemon and spices. Cook the soup for just 5 minutes before blending. 1. Heat the oil in a large saucepan over a medium heat. Add the onion, garlic and celery, and cook for 5 minutes or until softened. 2. Add the cumin, coriander and chilli, then add the beetroot/beet and pour in 1.50l/52fl oz/6½ cups water. Bring to the boil, then reduce the heat and simmer for 10 minutes or until the beetroot is just tender. 3. Transfer the mixture to a blender or food processor and whizz until smooth. Add the ground almonds and whizz again. Add the lemon juice and season with salt and plenty of pepper. 4. Divide the soup among four freezer-proof containers and freeze for up to 3 months any that you don’t want to eat soon. Defrost overnight in the fridge. Reheat a portion before you go to work and transfer to a vacuum food flask – or reheat it at work. Pack the yogurt to take with you. Ground almonds are packed with protein, and just a little adds a lovely richness to soups, stews and curries. Packed with... Beetroot/beet is crammed with iron, calcium, folate, betaine, B vitamins and antioxidants, which combine to make it a great detoxifier. A shorter cooking time means you’ll get the most from all these nutrients.